The recently released, comprehensive NPES and PRIMIR study, “World-wide Market for Print: Identifying Global Opportunities for the Print Industry,” conducted by the Economist Intelligence Unit (EIU), offers a roadmap of potential profit opportunities for savvy manufacturers and printers willing to negotiate the fragmentary nature of developed and emerging markets outside the U.S. Especially significant in global leadership position is China, posing a unique set of socio-economic and structural dynamics, well worth NPES members’ investigation for market entry or sales expansion strategies. The EIU forecasts that China’s printing industry will reach a market size of US$154 billion in 2017. The robust growth during 2007 to 2011 will continue through the end of the forecast period in 2017, although the growth rate will drop from 11.7% to 8.7%, making China the largest print market in the world by 2017 as volumes surpass those of the United States in 2016 (see Exhibit 1). In terms of demographics, China will remain the most populous country in 2017 with close to 1.4 billion people. Adult literacy in China at 95% is also high by global standards and will drive further consumption of print media. Rural to urban migration in China will be an important factor in the growth of the total accessible market for packaged goods. GDP per head will also increase from US$6,240 in 2012 to US$10,460 in 2017; and, private consumption per head will grow from US$2,240 to US$4,080 over the same time. China’s dynamics will lead to significant print market growth at an overall CAGR of 8.7% between 2012 and 2017. China’s gains in all product categories will be supported by healthy, but more moderate growth compared to its past economic performance. Still remaining one of the fastest-growing countries in the global economy, China’s GDP growth at 7.7% in 2013, will slow down to 6.3% by 2017. 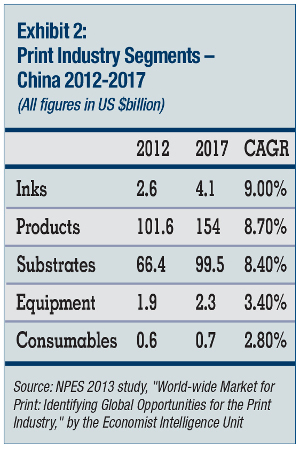 Sales of equipment, consumables, inks, and substrates will grow at high rates in China, but some potential for exports to China will face competition from a growing B2B used equipment market and local competitors producing consumables, inks, and substrates. Nevertheless, China’s increase in demand for flexographic equipment and digital equipment will be supported by rising incomes and demand for packaging and print advertising. 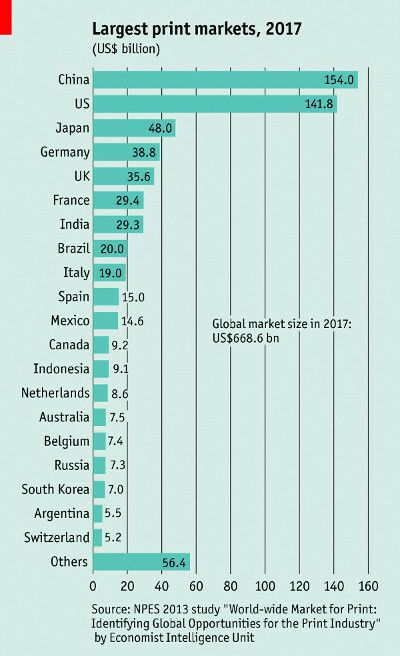 China will also be the second-largest market in substrates sales behind the United States—reaching close to US$100 billion in 2017 (see Exhibit 2). While all print product categories will see positive growth rates in the period 2012 to 2017, insert printing and direct mail printing will record the fastest growth rates, at 14.6% and 13.6% respectively, due to increased demand for non-commodity goods among the country’s rapidly growing middle class, fueling increased levels of print advertising. Despite China’s growth in all product categories, the greatest opportunities will be in packaging and publishing, which will grow at 9.2% and 9.1% respectively between 2012 and 2017. The packaging industry, which was 47.3% of total print product sales in 2012, will continue to grow to become 48.5% of total print product sales in 2017. A rapidly expanding middle class, higher consumer demand, and rising wages will all drive the growth of the packaging industry. China’s publishing segment will also expand its share of total print product sales from 29.9% in 2012 to 30.5% in 2017. This growth is primarily attributable to the large domestic market and increased demand for consumer goods driven by rising wages and a rapidly expanding class of people capable of, and interested in, purchasing non-necessity items. Unlike in the West, where many readers are gravitating towards online publications, readership of magazines, books, and newspapers is increasing in China. For print equipment producers, the Asian markets, particularly China, are going to be more important than all of the European markets. All segments of equipment sales are expected to grow between 2012 and 2017, though at much slower rates than print products. The overall growth rate for equipment sales in China during the period 2012 to 2017 is expected to be 3.4%. Inkjet equipment sales growth is expected to increase the most, at 4.7% between 2012 and 2017. Sheetfed offset lithographic equipment, however, will continue to have the largest sales volume in 2017, with a market size of US$562 million. Armed with key country demographics, printing industry trends, and the benefit of established market penetration services and advance investigative work, available through NPES—the rewards can be great. NPES and PRIMIR members should refer to the “World-wide Market for Print” study provided to them earlier this year for: much greater data on the growing China print market; in-depth data and research for the entire Asia-Pacific region and others; and, all 51 individual key country reports encompassed in the landmark NPES/PRIMIR study. 703/264-7200 or e-mail: rratnam@primir.org.